A Conversation With Bob Siegfried: Listen to Bob talk about life as a professor, his decades of work helping people find rewarding careers–including at midlife–while helping others recraft unsatisfying jobs into meaningful callings, and his plans for this Master Class itself. (20 mins.) Click here to stream the audio link to or download an mp3 here. We named this course Career Coaching North of Neutral with a tip of the hat to the late (and much missed) Chris Peterson whose spectacular positive psychology course was named the “North of Neutral Master Class”. ** Chris used the term in reference to the lifespace we inhabit when, having moved past the darkness and angst of the negative, we cross over the neutral zone and come to experience the light and the joy of the positive. This course is about coaching people to move forward in their lives and careers in the light and joy of the positive, i.e. North of Neutral. It’s about helping people find careers that are compatible with a positivity-fueled lifestyle. Thanks, Chris. **Chris actually taught two wonderful Master Classes for MentorCoach: “North of Neutral” and “Positive Psychology and Well-Being”. A little known fact is that for a time Chris’ bestselling book, A Primer in Positive Psychology, had the working title of Somewhere North of Neutral: A Primer in Positive Psychology. In the context of today’s world, what is known to work in moving forward in a career trajectory that supports a positivity-fueled lifestyle? How do we help our clients live the good life? In addition to reflecting on his own experience and the experience of career coaches he consulted, he studied the literature in a variety of fields including career development, psychology, counseling, coaching, personal development, management development and leadership development, entrepreneurship, staff development and positive organization science. • How to use positivity as a fundamental resource to keep moving forward. • How to use multiple lenses and mindsets to identify possibilities. • How to engage other people as resources and support for your quest. • How to select a best-fit, ideal future-self from a range of possible future-selves. • How to use various forms of assessment and inquiry to get a realistic picture of yourself for use as a platform for moving forward. • How to identify your strengths, values and other assets and and how to use them appropriately. • How to regularly scan the environment to stay abreast of what is happening in the world of work and employment. • How to use two-steps-ahead thinking to scan the environment for potential opportunities and challenges. • How to identify the need for course corrections and making them as you go. • How to create a personal fall-back plan which will be a secure refuge for you in a worst case scenario. In addition the class will provide you with the opportunity to work with a variety of tools, templates, and guidelines for putting these concepts and methods into action. Ample background readings from the research, practical and theoretical literature will be provided. 3. Open to All? 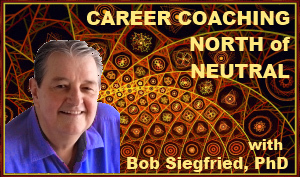 The Career Coaching-North of Neutral Master Class is open to all, both within the MentorCoach Community and without. 4. Take Career Coaching Class Again. Bob has created a new class based on three decades of work in the field. Students who have taken past MentorCoach career classes (Strategic Career Design Coaching) may take this class as well, receiving full credit. For CE information, see #10 below. This class provides twelve hours toward MentorCoach Certification as an elective for students meeting the class attendance requirement (See #10 below.) It can also provide 12 hours toward ICF Certification via an Accredited Coach Training Program such as MentorCoach or via the ICF Portfolio Approach. This class is also approved for 12 CCEUs from the International Coach Federation for students meeting the class attendance requirement (See #10 below.) There is no fee for ICF CCEUs. This class is approved for twelve hours of CEs for social workers (NASW) and Marriage and Family Therapists in California (BBS). The CE administration fee is $75. CEs for psychologists (APA) are not provided for this class. To receive credit for CEs, students must pay the CE fee and be present for 9.5 classes. Note: The CE fee applies only if you are a licensed mental health professional in the US and need CEs from one of the organizations listed above (NASW, BBS). Otherwise, when you register, indicate that you do not need to pay the CE fee by choosing the “Base Unit Price with NO CE’s” registration option. However, to receive credit for CEs, ICF CCEUs, credit toward MentorCoach Certification, or to receive a Certificate of Completion, you must be present for 10 of the 12 class hours. Bob Siegfried is a coach, consultant, and trainer who engages clients in the process of strengths based, generative change, empowering them to create more of what they want and less of what they don’t want in their personal, professional and organizational lives. Bob first began introducing clients and practitioners to life planning in the 70’s while teaching and researching career development at the Medical College of Pennsylvania.In his coaching practice, Since that time, Bob has helped hundreds of professionals make strategic career choices that for many have been life-changing. He has consulted to, facilitated training for, or coached clients at World Bank, General Motors, National Institutes of Health, Southern Regional Education Board, AICPA, Riggs Bank, General Electric, Carnegie Mellon University, Medical College of Pennsylvania, Villanova University and numerous of other public and private sector organizations. He is excited about bringing a lifetime of professional work in the career arena to MentorCoach through this Master Class. Over the 30 past years has worked as a psychologist, coach, consultant and educator. For the past ten years, he has taught graduate courses at Villanova University in career development and planning, diversity, and brief strategic therapy. He particularly loves teaching and mentoring people in career coaching. He holds a PhD in counselor education from the University of Pittsburgh. Throughout his career, Bob’s colleagues, students, workshop participants, and clients alike have consistently commented on his warmth, his respect for them and their ideas, his playfulness, and his ability to communicate clearly and to spark interest and insight. Bob appreciates engaging in activities with his family, making music, fly-fishing, and tinkering about the Harmonyville, PA country home he shares with his partner and wife Lisa, their cat Zoe, and the occasional country critter daring enough to risk sneaking into their house. A longtime member of the MentorCoach faculty, Bob also leads our Appreciative Inquiry Coaching Master Class. His website is www.Learning2Connect.com.